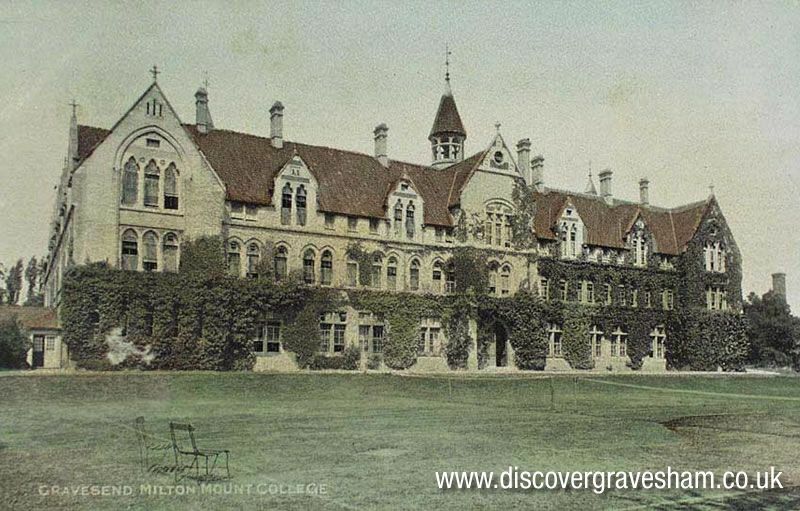 Milton Mount College stood on a high bank near the junction of Parrock Road with Echo Square until its demolition1972. It was founded as an educational institution for the daughters of Congregational ministers, although other pupils were also accepted. The foundation stone was laid in 1871. The architect was C.E. Robins of Southampton (cost £9,750). The college owed its existence to the Rev. William Guest, Minister of Princes Street Congregational Church. The first Headmistress was Miss Selina Hadland; a pioneer of girls' education associated with Miss Beale and Miss Buss said to be the first school in the country to teach domestic science. It remained as such until the 1914 18 war when, after the first air raid it moved first to Cirencester and then to Crawley, where it continued until after the 1939 45 war. When the school left, the building was used first as a hostel for Vickers' munitions workers and later for a time as a hospital for invalid soldiers. Its use for V.D. cases was the reason for the school refusing to return. In 1921, it was sold for an orphan school run by Roman Catholic educational authorities and opened by the Roman Catholic Bishop of Southwark in 1926 and continued as part of the Southwark Rescue Society. In 1940, the home was evacuated to Ugbrooke Park, Chudleigh, Devon, the home of Lord and Lady Clifford. It returned to Milton Mount in September 1945 and closed in 1951, after which a number of new homes and buildings were erected on the Parrock Road and Glen View frontages as St. Mary's Homes. During the 1939 45 war it was occupied by the Auxiliary (later National) Fire Service and the Women's Voluntary Service as a canteen. After remaining empty for some time it was demolished in 1972 and the site developed for housing.